Before I continue with my Mother's Day menu recipe recap, I wanted to share with you this little gem of a dish I threw together over the weekend. Since I was spending most of my time running around like a chicken with its head cut off, packing & prepping for BlogHer Food, I wanted to have something quick, tasty & filling on hand for the occasional break. The following dish was the result. Though it was unseasonably cold & rainy, I clung steadfastly to the idea that it was, in fact, still spring, and refrained from making soup all weekend (I did succumb after the hail storm and made this and this; they were ever-so-tasty). Instead, I put on a pot of red quinoa and went on the hunt for some veggies to mix into it. What I found in my fridge was even better than plain ol' veggies: the last few bunches of spring herbs from the farmer's market and plenty of lemons. Without hesitation, I set about to make a sort of unofficial tabbouleh. 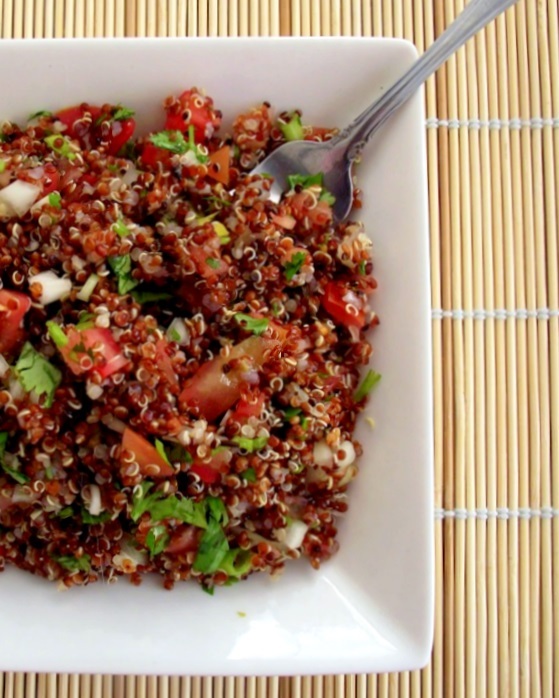 Traditionally prepared with bulgur, tabbouleh (or tabouli, as it's sometimes referred to) is one of those fabulous dishes that manages to scream "SUMMER!!!" with its vibrant colors and fresh, crisp flavors. There's nothing as refreshing as the combo of fresh parsley & mint along with juicy tomatoes and plenty of lemon juice & olive oil. But if you find yourself lacking some of those key ingredients, don't fret; tabbouleh is a versatile little salad and lends itself to a few variations. Since I didn't have bulgur - and because I like to sneak a little protein into my salads somehow - quinoa made a wonderful substitute as the base for my tabbouleh. I also didn't have the requisite mint that comes in the traditional dish, but I found that the combination of the remaining bunches of parsley, cilantro and a few chives gave this version a different, but equally crisp flavor that is enhanced by the simple dressing of lemon juice & olive oil. Other than that, there's not much to this one! It's quick, healthy, versatile and extremely affordable. It's perfect for Meatless Mondays or works great as a side to some grilled or roasted meats. Let's check out the recipe! Combine the lemon juice, olive oil, salt & pepper in a small bowl and whisk until well-combined. Set aside. In a larger bowl, combine the quinoa, onions and herbs. Add about half the dressing and toss everything together. Check for flavor and adjust accordingly by adding more dressing. Serve as a main salad on a bed of greens, or as a side for grilled meats or kabobs, and enjoy! This looks lovely! I've never had red quinoa before. I wonder if it tastes any different from the brand I buy. I'm going to try this soon. I've been wanting to try red quinoa for a while. Is it a different taste? or more just a different color from the plain quinoa? 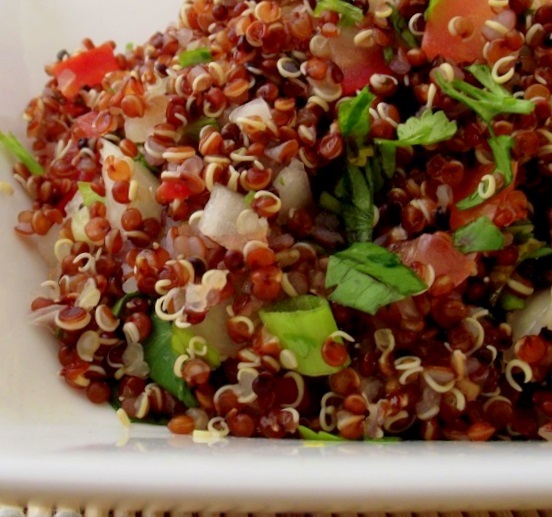 I love red quinoa and this recipe of yours definitely looks delicious. I'm looking forward to trying this recipe very soon. I'm sure my friends and family will love this. Thanks for sharing! My son's daycare uses quinoa in their pancakes with the batter to gift more nutrients. Those are some yummy pancakes.